When I came to abroad, I started missing first my family (parents and only brother) and second Bangladeshi sweets. (Still missing family but not sweets any more) I get so good milk here that making sweet is easy job. Just need your precious time for that. Because making sweets are time consuming. But I promise that you will just love the result. 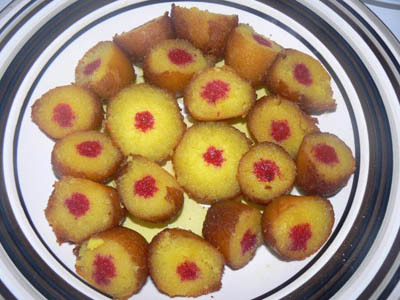 Mouchak is a sweet which taste close to cham cham and kalojam but very decorative. You can roll Mouchak in dry mawa. I haven’t roll in dry mawa this time. 1. First put a sauce pan on heat with 3 cups water and sugar. When sugar is melt and syrup comes into boiling point boiling point, turn off the heat. Keep aside. We need lukewarm syrup to soak the sweet. 2. Mix milk powder, self raising flour, semolina, nutmeg, saffron and cream. Need to be careful about adding cream because we want soft dough which we can work with (don’t make to soft which hard to shape). But on the other hand hard dough will make crack on sweet. 3. Divide the dough into 8-10 balls and make each into cylinder shape. 4. Heat the pan on low medium high with oil for deep fry. When I say deep fry that it means enough oil to deep the sweet while frying. Check the oil to put a little piece of dough in the oil if it sizzles and comes up slowly .It means the oil is ready. 5. When oil is ready (don’t make oil too hot, we will slow fry them), put the sweet in the oil with care and fry it all side till it becomes golden brown. 7. Soak sweet at least ½ hr. Take out the sweets from syrup and cut into half. Decor with red food color. is it 1/2 table-spoon or 1/2 cup of self raising flour? namta amar deya na….ami ei misti deshe kheyechi…tumi o kheyecho ..hoyto bhule gacho…recipe is certainly mine. Why don’t you create an YouTube channel as well. I am very sure that you can help lot of viewers who will love your recipes. how much water for the syrap? Hi Anu! 3cups of water. its written there. Thanks. another thing is can I use liquid milk instead of thickened cream. thank u.
I never use milk but I think that it will work. If you try let me know your out come. thanks. In Bihar the Mauchak was made by chhena rolled like chumchum and boiled in sugar syrup for hours in between adding hotwater to maintain the thickness of the syrup. The End product is reddish brown out side. It is cut in half and a layer of thick rabadi is put in between. They call it Mauchak toast! nice to know Milind. Mouchak toast sounds like lengcha to me. Please check my lengcha recipe. Thanks a lot. May Allah keep us all safe & healthy! Ameen.